Following the closure of the Roxy this month, New York City's last remaining roller disco is due to close in April 2007. A news report this weekend stated: 'Roller skaters are hoping the wheels at the city's only remaining roller rink won't screech to a halt. At a demonstration in Crown Heights Saturday, people came out to support the Empire Roller Skating Center, which has been sold and is slated to close its doors at the end of April. After nearly 70 years of fun on wheels, the building is scheduled to become a storage facility'. 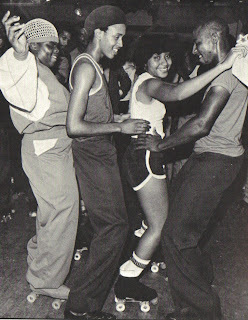 In 'Night Dancin'' (1980), a guide to the New York disco scene, Via Miezitis described the Empire in its heyday: 'Rainbows, clouds and blue skies cover the walls. Neon criss-crosses and circles mirror balls hung from high gymnasium-like ceil­ings and transform them into phosphorescent planets in outer space. More rainbow-colored neon outlines a large, square railed-off skating area contained within the main rink; the neon is re­flected on the ceiling and looks like a meteor or laser beams. Over 1000 skaters cover thousands of square feet of roller rink. Human satellites, they orbit defy­ing gravity, dancing and speeding effortlessly through space. Some re­semble glider planes that float in the air; still others appear as precision per­formance jets as they whirl, dip, roll, fall and suddenly cut across the paths of other "planes." 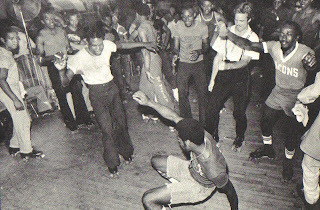 The Empire Roller Disco attracts the best roller disco skaters in the world, who perform their practiced and improvised disco routines regularly to disco beats spun by a regular disc jockey. The dee jay helps lead the skaters through the vari­ous peaks and dips of the speeding and furious en­ergy high that is roller disco at its best'. Quotes and images from 'Night Dancin'', text by Vita Miezitis, photographs by Bill Bernstein (New York: 1980). There is a petition against the closure of The Empire here.